The world of Runeterra is expanding further outwards, with a Shadow Isles lore update, a new board game, and a new Magical Girl-themed alternate universe based around Star Guardian Lux’s new companions. If that wasn’t enough, we also have a new champion: Ivern, the Green Father. Ivern is an odd duck in a lot of ways: he’s a support jungler (similar to how Kindred broke the mold by being designed as a marksman jungler), he can make bushes and enable his team to dash to a target. While we’ll go over the specifics of his kit shortly, the thing that’s most interesting about Ivern is how he demonstrates the evolution of Riot’s character design. League is, by its very nature, a game based on picking champions and murdering each other. In 2012, the company somewhat infamously said that they wanted to create characters with the depth of Don Draper or Tony Soprano. They’re not quite there yet, but Ivern represents a step in that direction. It helps that he also has one of the most revolutionary in-game kits we’ve ever seen. Passive: Friend of the Forest: Ivern’s pacifism comes through in his passive. He clicks on a jungle camp to create a grove, sacrificing some of his health and mana. After a few seconds, he clicks the grove and the camp scampers off, glad that for once they’re not getting pummelled. Ivern takes the buff and heads off to the next camp, except after level 5, when he creates copies of Red and Blue. This means that if you have a mana hungry mid laner, you don’t have to fight with them over Blue for the entire game. Ivern’s a generous guy, and he can share in the wealth. Q: Rootcaller: Ivern calls on his forest powers to send out a root, dealing magic damage and rooting the first enemy he hits. That’s pretty basic, but here’s where things get scary: Any ally who uses a basic attack on the target gets a generously ranged dash, similar to Lee Sin’s second Q. That means Ivern can get the entire team in on your priority target, all while smiling that placid smile of his. And now, we get to the really crazy ability. W: Brushmaker: Brushmaker has a passive and an active. Ivern’s basic attacks in brush deal increased magic damage and benefit from extra range, and he holds onto the buff for a couple of seconds after he leaves a brush. Sure, that’s neat, but the active allows him to create brushes anywhere on the map. Rengar, your time has come. E: Triggerseed: Ivern shields his ally with a seed, and the shield explodes for damage around him after a few seconds. Enemies caught in the radius are slowed. R: Daisy! : Daisy is Ivern’s friend, a golem who loves hugs. She rolls around the battlefield, hugging people a little too hard (and knocking them up on every third hit). Ivern can redirect Daisy, and before she leaves the battlefield, she waves goodbye. Ivern has been just revealed so it’s too early to do an expert analysis, but we can tell what kind of jungler he’ll be: the ultimate herbivore. He can’t fight unless he has Daisy up, and even then it’ll be dicey. Ivern can steal buffs and give the fruit of his labours to his midlaner, not just denying the enemy jungler’s buffs but giving his own mid laner the advantage. That being said, if he’s caught out, Ivern is going to have to skedaddle. A team who can play around Ivern, protecting him while he tends to the jungle, will reap the full benefits of this unorthodox jungler. It just remains to be seen whether a support can thrive in a competitive counter-jungling environment, or whether he’ll be forced out of the game entirely. League itself and League the lore are at odds, and Riot has acknowledged this by separating the two and declaring that the game that we play is non-canon. The problem goes farther than that, though: for a character to exist in a MOBA, they have to have a kit, they have to be equipped for violence (or, at the very least, enabling violence) and anything outside of the battlefield becomes incredibly difficult to imprint in players’ minds. We know that Jhin wields several kinds of ammo off the field to provide the most glorious and cinematic deaths, for instance, but fans were mostly frustrated that they weren’t able to access these tools in game after seeing them shown off. Lore updates are mostly centered around giving characters compelling lives off the Rift, but again, it’s hard to translate these stories to an in-game experience outside champion quotes and taunts. Ivern breaks the mold in an exciting way, in that he’s a pacifist and a friend to the forest, and this is shown in his in game mechanics. Ivern doesn’t kill the jungle camps, oh no! He protects them and removes them from the violence of the Rift. Even Daisy, his ultimate, only wants to hug people! Riot has made compelling characters before, but has been forced to build them as characters who would ultimately be represented on the Rift. They need to be comfortable with murder, or at least capable of violence. Bard was a great start to an out-of-the-box champion, but Ivern takes that design to another level. 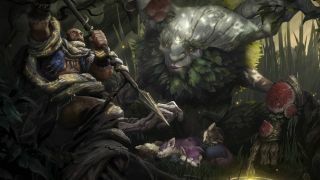 A character’s in-game representation will dominate the perception of them and set the tone for fans; Ivern’s friendly, yet slightly off pacifism is perfectly depicted. Ivern is an awesome champion and a welcome addition to the roster, even if it’s not clear how he’ll perform at the lowest and highest tiers of the game. At the very least, he’s proof that champion design has come a long way both aesthetically and mechanically. We’ve come a long way from the days of Zyra, and Riot is settling down roots to innovate even further.